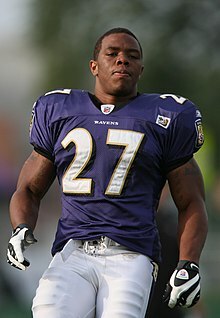 Raymell "Ray" Rice (born January 22, 1987 in New Rochelle, New York) is an American football running back. He is currently suspended indefinitely from the National Football League (NFL). He played for the Baltimore Ravens from 2008 until he was released on September 8, 2014. He was drafted out of the Rutgers University by the Baltimore Ravens with the 55th pick in the second round of the 2008 NFL Draft. Rice was selected for his very first Pro Bowl in 2009. He also was in the 2011 and 2012 Pro Bowl. He won Super Bowl XLVII with the Ravens when they defeated the San Francisco 49ers 34-31. On March 27, 2014, Rice was arrested and indicted for third-degree aggravated assault after an incident at the Revel Casino in Atlantic City, New Jersey where he punched his then-fiancée (now wife) Janay Palmer in the face. The punch knocked her unconscious. A video posted by TMZ showed Rice dragging Palmer's body out of an elevator. On March 27, 2014, Rice was indicted by a grand jury on third-degree aggravated assault, with a possible jail sentence for three to five years and a fine of up to $15,000. Rice married Palmer on March 28, 2014. On July 25, 2014, Rice was suspended for the first two games of the 2014 NFL season for the incident. After Rice agreed to undergo court-supervised counseling, the charges were dropped. On September 8, 2014, another video was released by TMZ that featured additional footage from an elevator camera that showed Rice punching Palmer. After seeing this, the Baltimore Ravens terminated Rice's contract and shortly afterward, NFL Commissioner Roger Goodell announced that Rice had been suspended indefinitely from the NFL.